Cakes, Cuppies And Other Confections: Gourmet Anyone? Simple cupcakes are great. The ratio of moist cake to creamy buttercream generally hits the spot and it is difficult to find a person who would say no to a cupcake. While reflecting on how wonderful cupcakes really are, I started to ask myself..."can they be improved?" Of course they can! A client was having a fancy party and wanted cupcakes to help celebrate but not just any cupcakes. She needed something with a little flair. So I came up with these three gourmet cupcake recipes, all with filling and all with an extra little somethin' somethin' on the top. The first flavor started with my salted caramel chocolate mudslide cupcake. These are always my best seller and I don’t ever doubt their flavour factor. People love them. Instead of doing a vanilla buttercream with a hint of salted caramel mixed in, I did a swirl of chocolate buttercream and salted caramel butter cream on top and then to take it over the edge I made circles of dark chocolate lattice and while the chocolate was still wet I sprinkled them with large flaked sea salt. 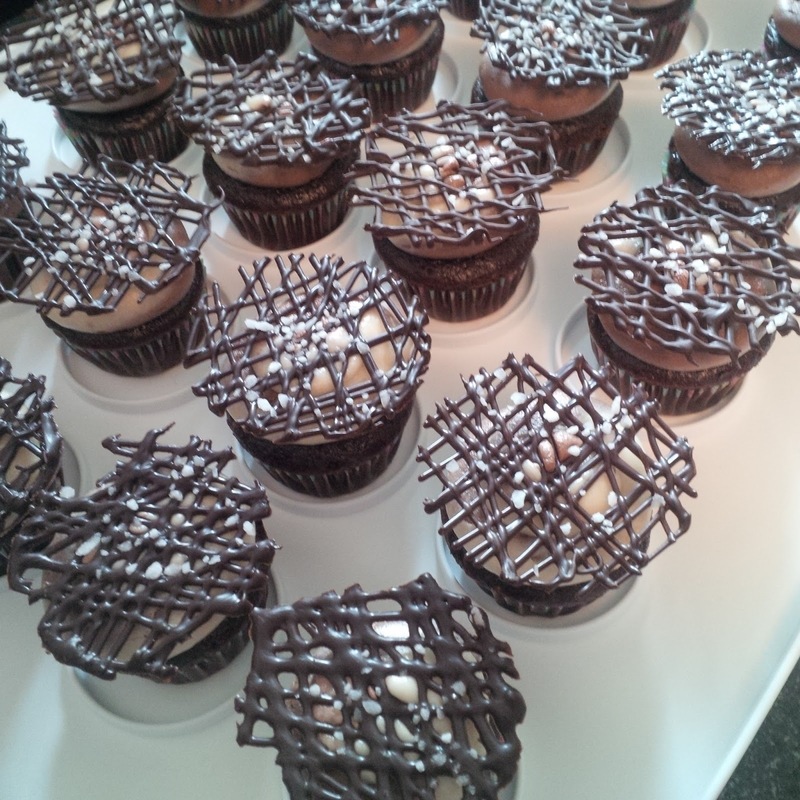 After the chocolate hardened, I graced the top of each cupcake with the decoration. These were excellent. My gourmet twist on an old flavour has now become a new best seller. 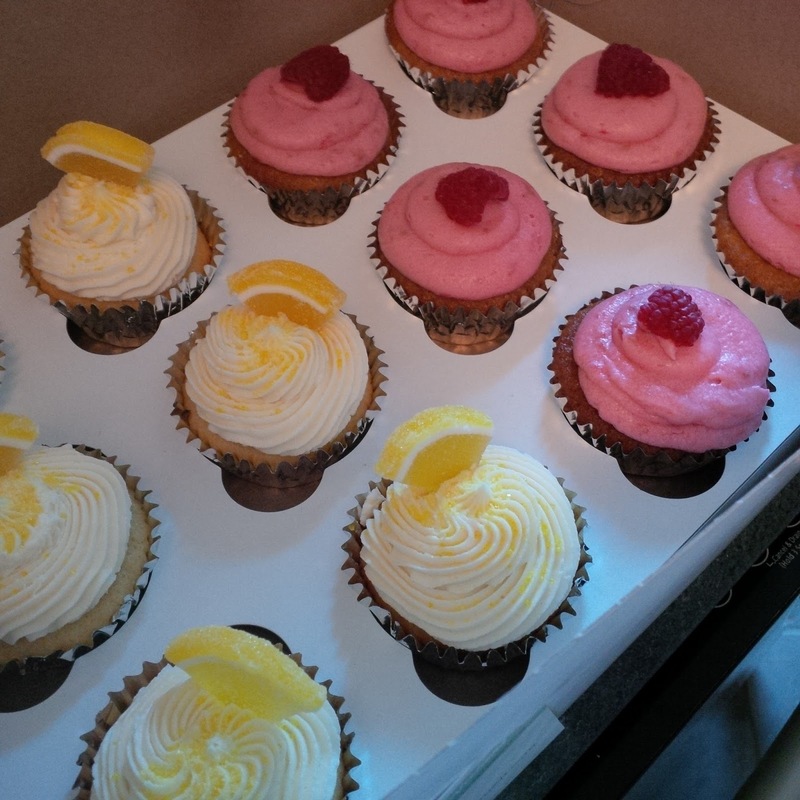 The second flavour was a fresh lemon cupcake with a lemon buttercream. These cupcakes tasted like sunshine. If you like lemon flavoured sweets, these are the cakes for you. I took these over the top by making creamy vanilla custard to fill the center of these cupcakes and topping them off with a wedge of lemon candy and some yellow sanding sugar. The third flavour, a new favourite of my official taste tester, Vanilla cupcakes filled with white chocolate raspberry cheesecake and topped with a fresh raspberry buttercream and a slice of raspberry. I started by baking a crustless white chocolate raspberry cheesecake. It was a velvety cheesecake, swirled with homemade raspberry preserves. After doing some research on cheesecake stuffed cupcakes, I decided to bake the cheesecake portion twice, by placing slices of cooked and cooled cheesecake in-between layers of cupcake batter and then baking off the cupcakes. The buttercream couldn’t be fresher tasting. I literally threw a handful of fresh raspberries into the mixer while making my vanilla buttercream. The raspberries created a beautiful dark pink colour and added their wonderful tartness to the flavour. I topped each cupcake with a piece of raspberry so people had an idea of what they were getting into. All three of these cupcakes added that extra flair to the party planners were going for with their stuffed insides and the small treats gracing their tops. 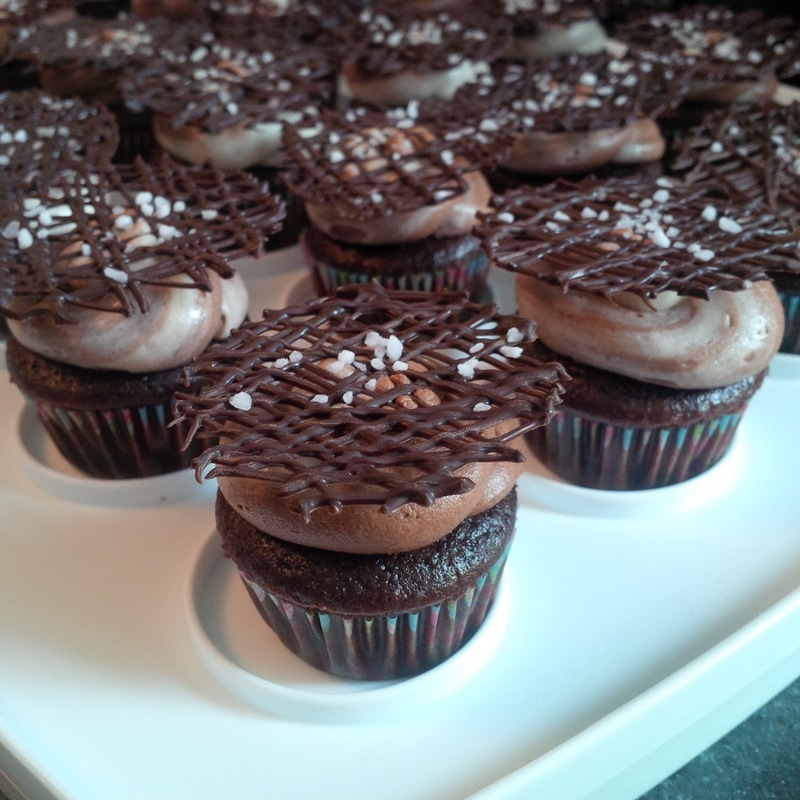 August Cupcake of the Month!